iCloud is Apple’s free online service, which includes contact syncing among its many features. BusyContacts can connect to iCloud for syncing contacts across your devices. BusyContacts can use iCloud to sync contact data across your devices. Choose iCloud from the Server Type pop-up menu, enter your Apple ID and password, and click OK. Note: You must use an app-specific password to sync BusyContacts with iCloud. Apple requires all third-party apps that sync with iCloud (like BusyContacts) to use app-specific passwords. An app-specific password is essentially a custom password that is different than your standard iCloud password. Only Apple's apps (Mail, Calendar and Contacts) can use your standard iCloud password. All other apps must use an app-specific password to connect with your iCloud account. 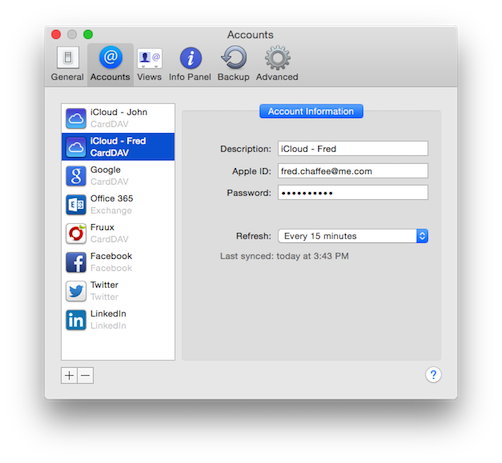 Please read these instructions for setting up an iCloud App-Specific password for BusyContacts. For more information, see iCloud: Limits for contact, address books and Reminders.